Whats the CORE swap return timeframe? Dividends will be sent on the 1st of October. Best to do it by then. We want to thank everyone very much for ongoing support for the new CORE concept and for all purchases of CORE assets during the month of September together with the latest ones! We want to also remind everyone that supply of all outstanding assets each month is combined from the public and founder`s shares with balance 49% public, 51% founder so there will be 2.450.000 CORE assets available to public ever unless some swaps with founder shares commennce in the future with other ventures. There are only about 360.000 of CORE assets as of now (together with all swapped assets) in investors hands and new assets will be released still in small tranches each month. I am more than happy and honoured to announce that I was propositioned today and agreed to be co-director of BTCOR. Sorry for the slight delay, BTCOR's Magazine, October edition is now available for viewing. 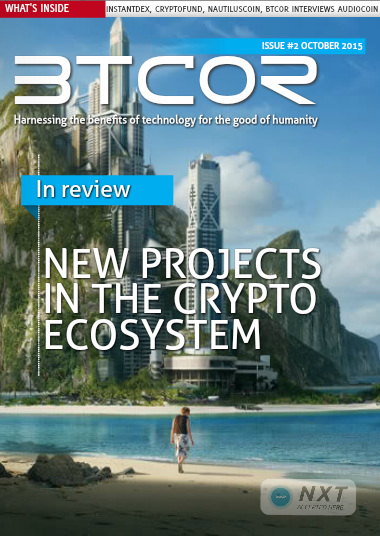 If you could help spread the magazine around the crypto world that would be great, it's a good advertisement for BTCOR and the NXT eco-system as a whole. ​*What's inside you say? 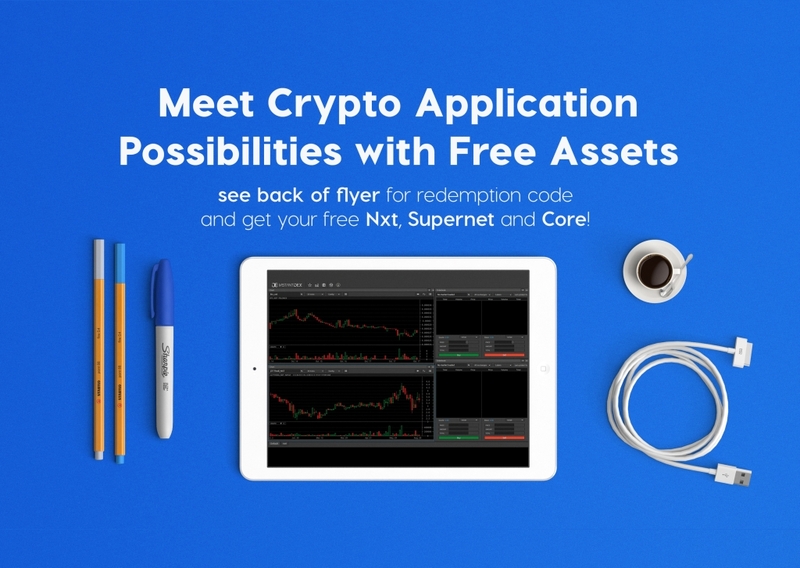 *​ BTCOR and NXT/SuperNet news. Audiocoin interview. InstantDEX article. Damon's Article. EOM Report. And if the stars align we should see some really cool stuff inside next month's edition too. CORE ... The Principal CORE Group Asset. 1. 70% from trading profit will go to dividends, 25% from trading profit will be added to the new trading purse for November, 5% veteran leauge of heroes/dev. 2. 75% from dividends of assets in treasury will go to dividends, 25% for treasury(investments, buy walls, nav increase etc). 3. 75% from new assets sales for treasury(investments, buy walls, nav increase etc), 25% from new assets sales will be added to the new trading purse for November. Each month, 20% of the CORE sell wall from the asset issuer will be available for the exchange with the featured assets through the last week of the month. Orders queue will be set by the time of DMs to me. Exchange rates will be set when the last week of the month starts. Orders can be set through DM at once. Featured assets will be changing each month. ​​​Note:​​​ If the sell wall from the asset issuer is sold before the last week of the month starts, there will be no direct exchange available. New bounty available for designing the best SuperNET/NXT/CORE starter which would catch the eye of the standard person outside the crypto. It should have the size more or less of the standard envelope. It should contain also important SuperNET/NXT/CORE graphics with important addresses. Designs need to be delivered up to 24th of October. November issue of BTCOR magazine magazine.btcor.co will be printed and distributed to 1000 people in the Netherlands through the shop networks, student clubs, conferences etc. There will be starters inside the magazine with the code available for redeeming. Each person will receive NXT and some assets. 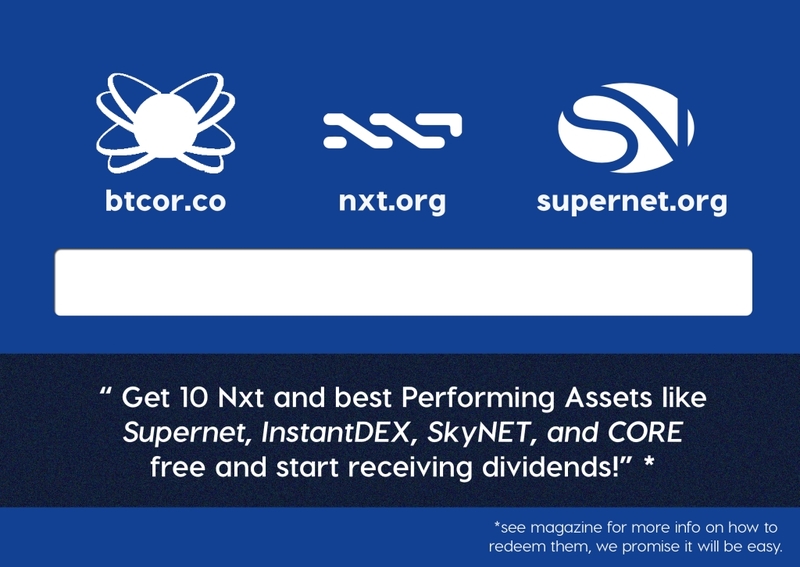 Above SuperNET and NXT, each of the assets will have detailed description for the standard person outside the crypto. There will be too tutorial about how to use the NXT wallet. Geez....this community just keeps creating good stuff. If you're doing a magazine distribution in NL.....do you have anyone doing distro in Amsterdam ? Just joined Slack channel...yes you do. I'm gonna hassle Cas in the AM. Thank you again for your huge constant support guys! There is small community surrounding BTCOR yet but with great team members, skills, results, great tech available from SuperNET/NXT environment, personal plans, incoming platform, services and collaborations that are forming behind the scenes, we will make this statement from our CEO and great leader more than real! "With a cohesive effort, it would be a simple feat to make BTCOR one of the most powerful ambassadors for NXT and SuperNET that we have seen to date. Not only in terms of share value, but because of the moral fiber that underpins our work ethic and intentions on a grander scale. House"
PS. Trading results are looking great as of now and it is the middle of the month. Looking forward to distributing the magazine.